As I prepare to rent a 24-foot truck next week and empty out our storage facility, I have been reflecting on the past two years. This journey has brought me many places and taught me so, so much, some of which I’ve shared on here, but much of which is waiting to come out once I have a little distance from the journey. Now that the travels are coming to an end and I am moving somewhere that, surprisingly, seems to meet almost all of my initial criteria in what I was looking for in a new place to call home (more on that in a later post), I am coming to terms with a change in focus and identity. While the past two years were spent exploring new corners of the country and trying to figure out where we were going to lay our head each night, I will now be focusing on setting up a home in a town where we know no one. I will be sorting through the massive quantity of things we stored, stripping out the inessentials. And since I am still the same person I have always been, I will be doing a healthy bit of exploring our new home state. It is with this frame of mind that I recently enjoyed The Happiness of Pursuit by Chris Guillebeau. I will mention upfront that I thought the book was rather choppy and could have been edited better, but I really enjoyed the subject matter. The author pursued a quest to visit every single country, which makes my goal to visit all 50 states look like child’s play. But the book is about more than his quest. It’s about quests in general and it focuses on a diverse bunch of folks that have all pursued their own version of a quest. My favorite was a woman from Oklahoma who set out to cook one full meal each week from every single country in alphabetical order. It took her four years, but the impacts went well beyond what she had imagined. Throughout the book, the author discusses different stages of a personal quest and puts together pointers for discovering your own quest. Since we are winding down our own version of a quest, the book was timely. Especially the parts that discussed how you may feel once your quest is complete. For some, like the birdwatcher who wanted to see as many different species of bird as she could (and eventually broke the world record doing so), their quest is never really over. But for people who wish to walk across the country, see all of the Roman Catholic Basilicas in the United States, or have a date in each state (all actual quests discussed in the book), there is a clear ending. For me, this journey also has a clear ending, and this is it. After almost two years of choosing to live without a home, or choosing to make anywhere and everywhere a home, I will be picking one spot and making a home there. This will be a transition for all of us, especially for the little guy who asks us EVERY SINGLE DAY “where will we be driving to today?” and “what state are we going to today?” After three weeks in the same house in Maryland, he had a fit that we were going back to the same house because “it’s just the same!” Yeah, so I’ll be dealing with that, too. I received this book from Blogging for Books for this review; however, I am completely honest in my reviews. If I didn’t like the book, you would hear about it. One of my goals for this year is to simplify, simplify, simplify. After living out of a car for close to two years, I’ve come to appreciate the beauty and freedom of living with fewer things. But simplicity is not always about objects. There are many things that clutter our lives – commitments, electronic distractions, friends or family that bring us down, unhealthy habits, and on and on. Each month I am going to issue a challenge to simplify some part of my, and if you’ll join me, your life. Since we won’t be moved into a new space until later this month (details in a future post! ), I’m going to focus on simplifying a non-stuff area of my life this month – Email. My goal, which I’ve admittedly been working towards for the past two months, is to have zero emails in my inboxes at least once a week. For me, that means hitting zero in each of my two email inboxes each Friday. Don’t run away too fast, that goal may not be appropriate for you, yet, but you can surely get there. Stick to the personal accounts right now, and try a few of the following things to get you on your way. 1. Count how many emails you have in your inbox. If you’re like me and you delete or save your emails into folders after your respond, then you should (hopefully) have less than 100 emails in your inbox. If this is the case, go through your inbox quickly and delete or file away anything that is in there that you’ve read and do not need to address or that you do not need to read. 2. Give yourself a goal to address three, five, ten emails a day. The number will depend upon how many emails you have to cull through and how ambitious you are. Make it reasonable, but pick a number that will get you somewhere. 3. Once you’re down to the emails that will take longer to address, limit yourself to addressing one or two per day. 4. Pretty soon you’ll be getting close to the beauty of an empty inbox. Keep plugging away until you get there. Don’t stop at an inbox with three emails or five or even one. Those last few will be the hardest, but they’re also the most important to address. 5. Once you hit zero, make it a goal to continue to hit it at least once a week. If you don’t do this, the emails will just build up again, silently asking you to do something each time you log in to your account. 6. Along the way, you will get new emails (duh!). Respond to these as you get them. Don’t let them linger. 7. Most importantly, take preventative action. Take yourself off of every single mailing list that does not serve you. Don’t reflexively delete like I used to do. Consider each email you get and if it is something that you would delete without thinking, then take yourself off that mailing list right now. The best way I have found to do this is to spend one week not deleting anything from my email before first opening it, considering it, and then responding, reading, or unsubscribing. It takes a bit of remembering not to just delete away on my phone, but I am always thankful the following week when the flow of junk has subsided. Do you already subscribe to the philosophy of an empty inbox? If not, try it. See if it makes you calmer and takes one thing away from your mental to-do list. It has forced me to respond to emails I had been putting off responding to for months and, in some cases, years. Freeing up the mental space, tiny as it was, devoted to those unanswered emails allows me to spend that space on more important pursuits. Plus, cutting out the junk helps me to limit the advertising to which I’m exposed. But, most importantly, an empty inbox helps me to be more prompt and thoughtful in getting back to people. And connecting with people is what this is about, right? After sharing my goals here and in a couple of groups that I belong to, simplifying seemed to resonate with many of you. 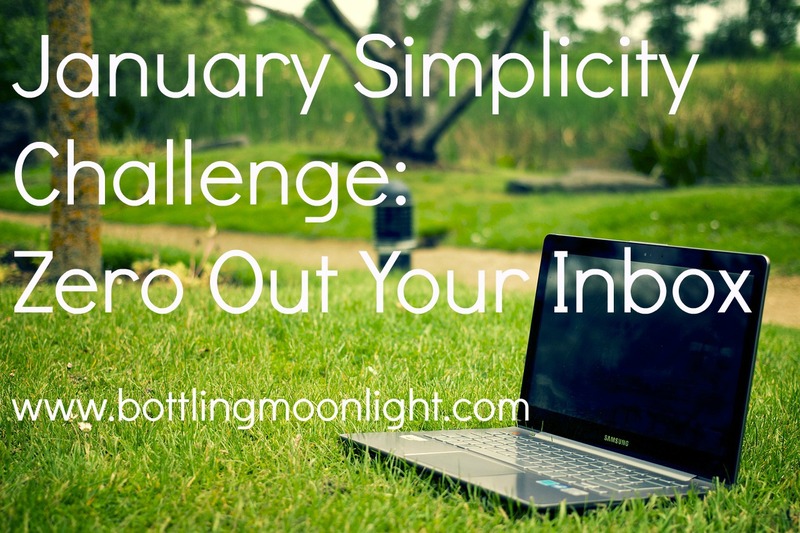 I will be sharing Simplicity Challenges each month of 2015 to help motivate us to meet our goals. Please join with me and let me know your progress at the end of each month. If you’re on twitter, you can follow me at @bottlemoonlight and tweet about the challenge using #simplicitychallenge. If you participate in each of the monthly Simplicity Challenges this year (please let me know in the comments on each Challenge post) and sign up to receive my posts via email (upper right), expect something awesome from me at the end of the year as a huge thank you for taking the journey with me. 2014 has been a year full of growth. It was challenging and, at times, no fun at all. But I also grew several important friendships and had many amazing moments with my family. And since I would not be where I am right now if we had chosen an easier path last year, I don’t think I would have changed any of those big decisions. Knowing that we are on the cusp of something new (post forthcoming about our upcoming move!!! ), I spent the last few weeks putting together personal goals for next year with strategies for accomplishing each. Instead of brainstorming a few resolutions on the last day of the year, I decided to put in the effort to develop goals in several different areas of my life that need some attention. And to get me there, I’m enlisting your help. By making my goals public and checking back in on them every so often on Bottling Moonlight, I am hoping that the accountability will help me to persevere. I have chosen to focus on three areas of my life and make serious strides towards the person I would like to be. Writing. Over the past decade, I have come to appreciate the importance of pulling words out of the jumble in my head and forcing myself to write what I am thinking. That sounds so easy – at least it always did to me. It is not. But it is so worth it. How many times do you have an amazing insight that you then try to explain to someone, but end up grasping at how to put this ray of light into words? This happens to me frequently. But through writing, I have gotten better at translating those ephemeral thoughts into real ideas to be shared and discussed. Better yet, the process always changes those thoughts and polishes off the rough points. I enjoy writing, but after two years of regularly writing (both here and into many half-finished documents on my hard drive), I now feel the need to write. My goal – to write every single day of 2015. Are you a writer? Have you made writing goals for yourself? Or painting, sculpting, music-making, crafting, creating goals? If so, is anyone interested in being accountability partners? We could check in once a week and keep each other on track. Simplifying. This has become a theme, both in my life and on Bottling Moonlight. The past two years have taught me many things, but nothing quite so repetitively as the beauty and freedom that comes from living simply. As we transition from being nomads to living in a sticks and bricks house, we will be moving the contents of our former life with us. Before we left on our journey, we packed everything up and locked it away in a storage unit in central Pennsylvania. Any free time we had before we left was spent on planning the trip, not on deciding what to store and what to give away. As a result, there is a LOT that we stored that we do not need or want. I plan to go through all of it this year and simplify, simplify, simplify. By way of making it into a game, I decided to put a number to it. I plan to donate, throw out, or sell at least 1,000 items over the course of 2015. There is no scientific reason for picking that number, but it represents where I’d like to be a year from now with regard to owning stuff. The less I own, the less that owns me. Anyone interested in doing this with me? No need to pick such an ambitious number. Perhaps you don’t even want to pick a number and instead pick an area of your home or life that needs serious simplifying. Let me know in the comments or send me a message if you’re interested in simplifying together. If there are a few of us (near or far), we can become the Simplifying Support Squad. Or maybe you can come up with something less cheesy. That shouldn’t be too hard. Health. I left this one for last since it is the most predictable. And though I like to buck tradition, I will not skip this one because it is too important. I have spent the last seven years slowly gaining weight and getting less fit. While I am not an unhealthy eater, I do have some unhealthy habits to break. And I have a ways to go before I am the kind of healthy eater that I want to be. I have a whole list of strategies to be healthier this year, including cutting out substantially all wheat products and processed sugar and exercising at least four times a week. But I am also setting a number to my goal – to lose 25 pounds by the end of the year. This was the hardest goal to make public, but also the most important. I want to be healthier for myself and my family. And I’ve already recruited a dear friend who also has health goals and we’ll be checking in regularly to keep each other on task. Best part of that? That we’ll be in contact more frequently since we haven’t lived in the same place in a very long time. 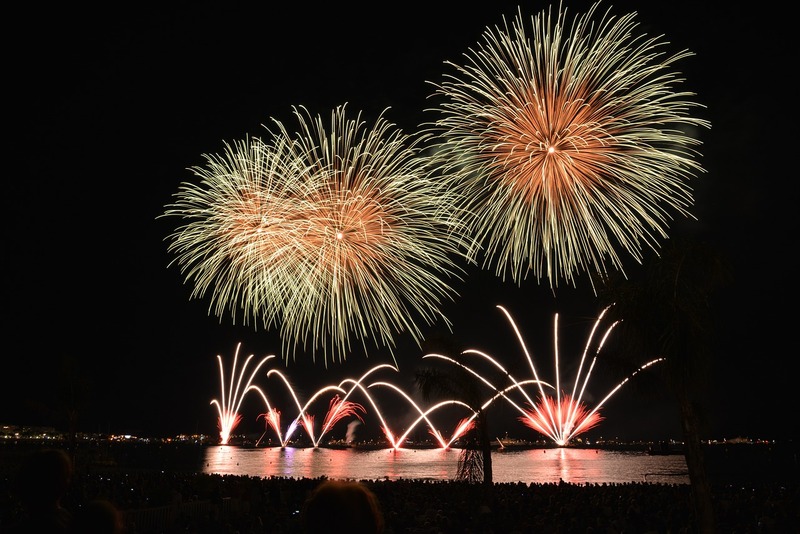 What do you have planned for 2015? Have you made any resolutions or are you taking my path and making personal goals for the year? If you are not setting any goals for this year, how do you want your life to be different on January 1, 2016? Is there anything you can do now that can get you one step closer to that different life?